The island of Philae in Egypt, which holds some seventeen Egyptian temples dating between the 26th dynasty and the Greco-Roman period, lay under water for six months each year following the construction of the Aswan Dam. Action to save the monuments was first taken in 1965 by the Ministry of Culture in collaboration with UNESCO. During the first stage over 1,000 iron sheet curtains were driven into the Nile to mark the boundaries of a temporary dam encircling the island. Then 366,000 cubic yards of sand was filled into the course of the dam, the intention being to keep the Nile waters from the land in order that the monuments could be cleaned prior to their eventual removal. 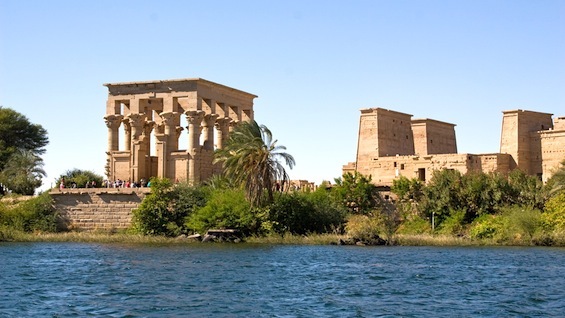 Work is now taking place on the final stage of levelling and resurfacing the new site for the Philae Temples on Agilca island, and dismantling 13 of the temples started in May 1975. 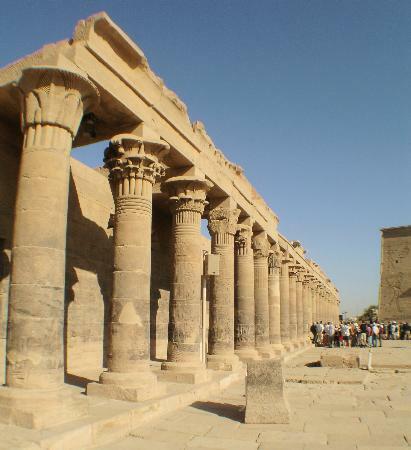 The main temples in ancient Egypt are dedicated to the goddess Isis and her son Horus (the walls are filled with reliefs depicting Ptolemaic and Roman emperors at sacrificial ceremonies). Other monuments on Philae include a temple to Hathor, the Kiosk which is one of the finest buildings on the island, the Arch of Hadrian, the Temple of Harendotes and the ruins of a Temple of Augustus, among others.